When it comes to the economy of small bathroom space, we often stunble in meditation what accessories to buy to provide the most harmonious visual appeal of your utilitarian area and to do it in an easiest way in addition to the lowest cost. It’s not a secret to anybody, that every slightest detail of the interior can affect the overall mood and perception of the bathroom, so if you have imagined the concept of the bathroom renovation including the tile finishing, shower cabin or bathtub, form of sink and tap, you can proceed to the next step of bathroom designing. 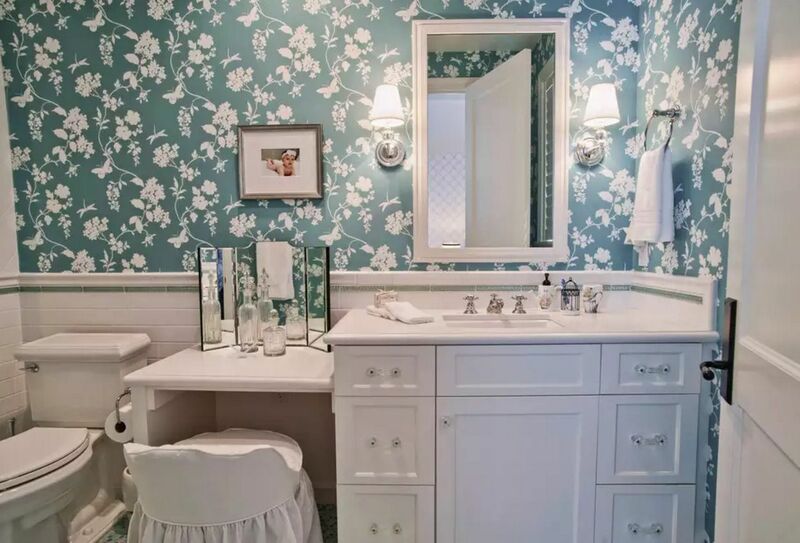 Let`s review some of the most effective and stunning small bathroom space saving vanity ideas. The unusual modern hi-tech design of the bathroom vanity can be very relevant for the classic style of the interior, as we can see at the photo above. Lime nice looking vanity has created the luscious accent in rather monotonous interior with classic small tile of the bathtub. And we could not pass by the photo below. It is not the receipt for small spaces, but still, you can take the concept of the “hovering” airy designed surfaces with utmost practicality and functionality. Even the tap is mounted into the aluminium shelf for hygienic accessories. And the wooden vanity is the only contrasting detail in the bathroom to match the nice natural structure of the wooden trimmed ceiling. 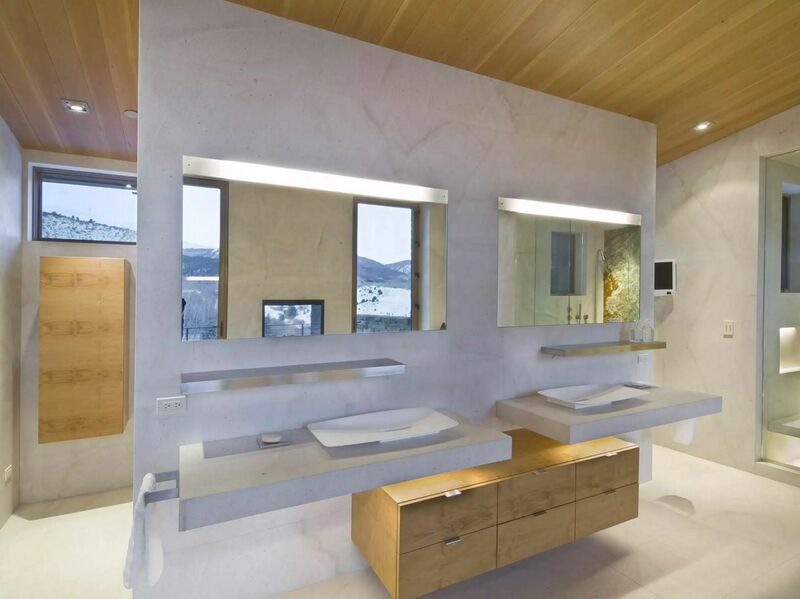 Backlight of the mirrors and the lighting under the sinks completes and finishes the futuristic image. 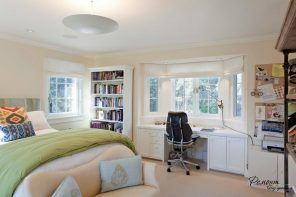 Round niches and forms are the ideal space-saving formula. 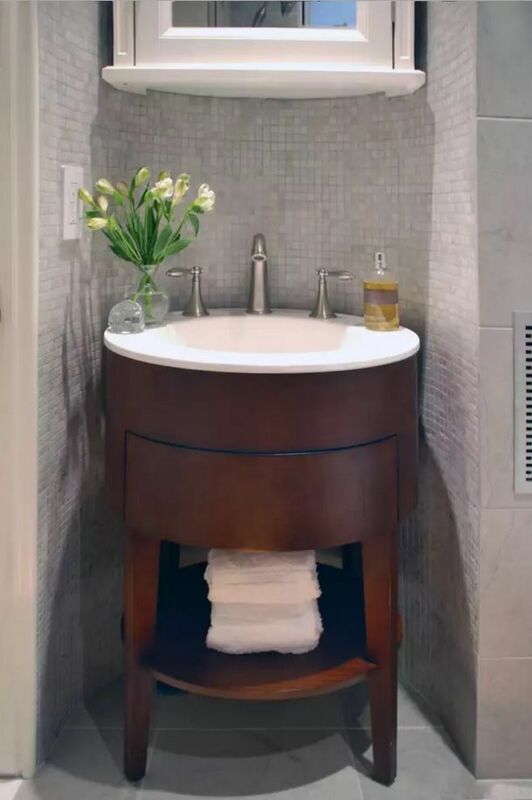 The small nook hiding in the wall was able to accommodate nice looking round sink built into the vanity with chrome handles and tap. Here we can also see a hanging vanity with the mirror, so this place can be considered as the full-fledged area for morning and evening hygienic procedures. 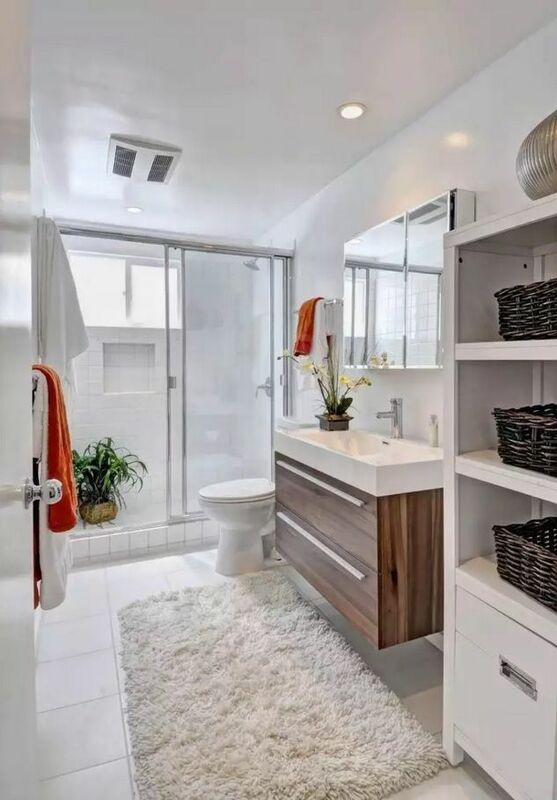 The fall theme of this small bathroom is somplimented bi nice pebble mosaic tile and the universal vanity with an open bar for the towel and the open shelf at the bottom. Wooden stylistic, as we can see, is very popular in the mix with white marble or ceramic surfaces. It brings a note of contrast into the calm interior and blends well with natural stone tile on the floor. 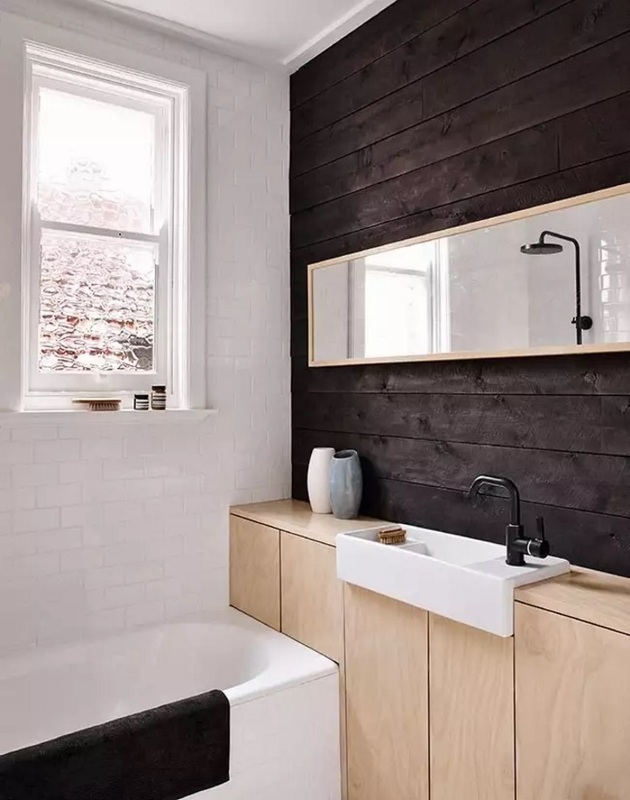 The unusual form of the sink, tap and vanity and the shelf for accessories continues the general contemporary minimalistic plot of the bathroom design. White surfaces dilute nicely the dark pastel colors of the wall finishing. The complete wooden furniture set in the bathroom also looks appropriate in the small light bathroom design. Wooden vanity looks perfect even at the background of the unique image of the mosaic tile. 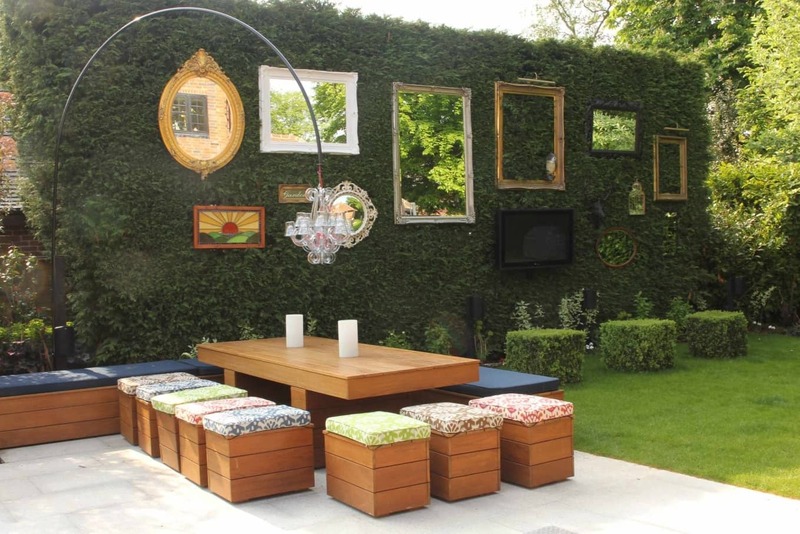 So, we can use such vanities even in the boldest designs. 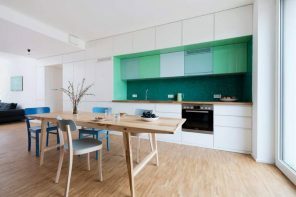 Fully white interior doesn’t annoy and bore with its monotonous sirfaces due to the picture at the wall and gray floor. However, we would recommend you to avoid finishing your bathroom in one color only. It will lose relevance and neatness with time, and any other accessories would seem inappropriately bright spashes of color here. In addition, such interior would be very sensitive to the frequency of cleaning. It is better to decorate the white interior with printed water repellent wallapaper. And here we can see the decorating option with an accent wall and wide mirror. The vanity is in the form of console in the center of the composition. The lamp is mounted separately from peculiar design of decorative color gradient in the bathroom. Crude timber treated with water repellent paint and the solid vanity console is representing the totally unique and fresh design. At the photo below we can see the small built-in vanity cabinet with chrome inlays and spherical sink which fits well the creamy bathroom design. 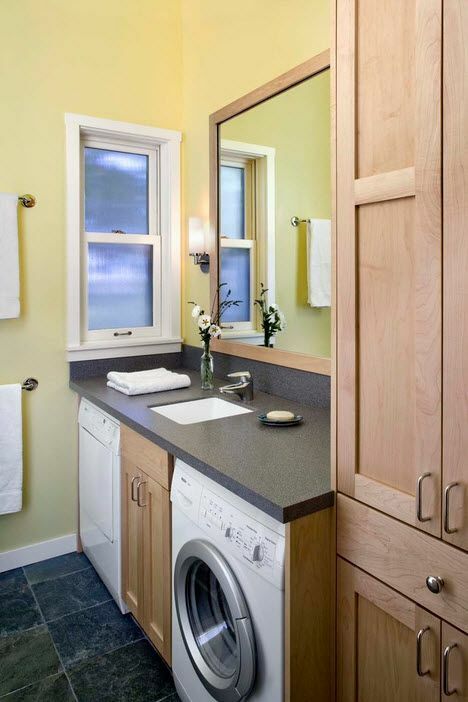 As we have seen already, the absolutely most used material for bathroom vanities is wood. Despite the abundance of finishing materials for walls, floor and ceiling, we can receive absolutely gorgeous and various vanities made of wood.